Why do I want Masterpiece Thundercracker? Discussion in 'Transformers Toy Discussion' started by aledromo, Aug 9, 2010. Seriously. I've got that wandering fingertip syndrome that keeps me going to eBay to check the latest in the pool of available Thundercrackers. Thing is, I already have MP Starscream and Skywarp. I have this mold twice! And yet something inside me screams I need to complete the seeker trilogy. I had the same splinter in my mind over the classics versions, and once the universe smiled at me and provided me with the complete set the splinter went away but didn't leave me with any fireworks of satisfaction. Just a noticeable hole next to the MPs. Most of us vilify the art of the repaint, but is everyone out there as insane as I am regarding the seekers? Will someone please talk me out of spending my kid's college money (not really; kidding) just to get a blue version of a toy I already own? Even if you already have Skywarp and Starscream, MP Thundercracker is still the best Thundercracker ever made. 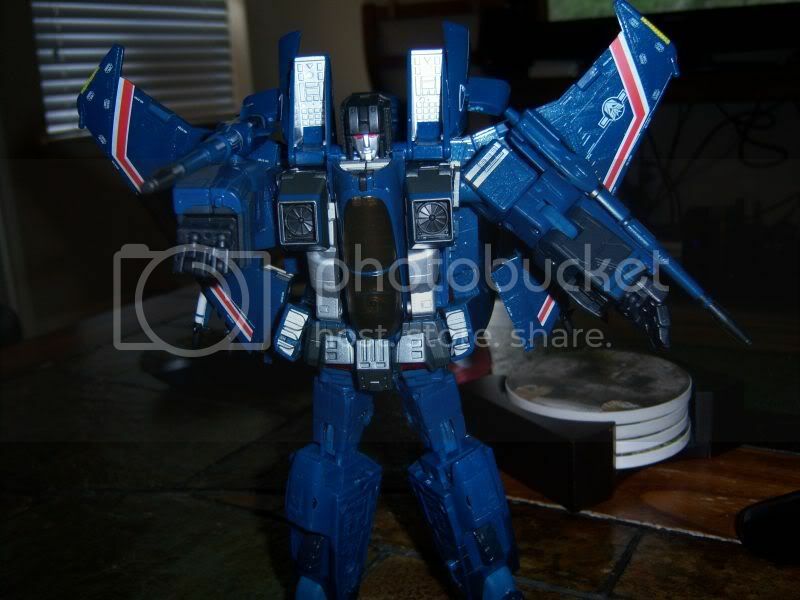 Seriously Thundercracker is the best looking colour scheme of the MP Seekers... at least in my opinion. I just love that blue. But realistically, if you can afford it, buy it. 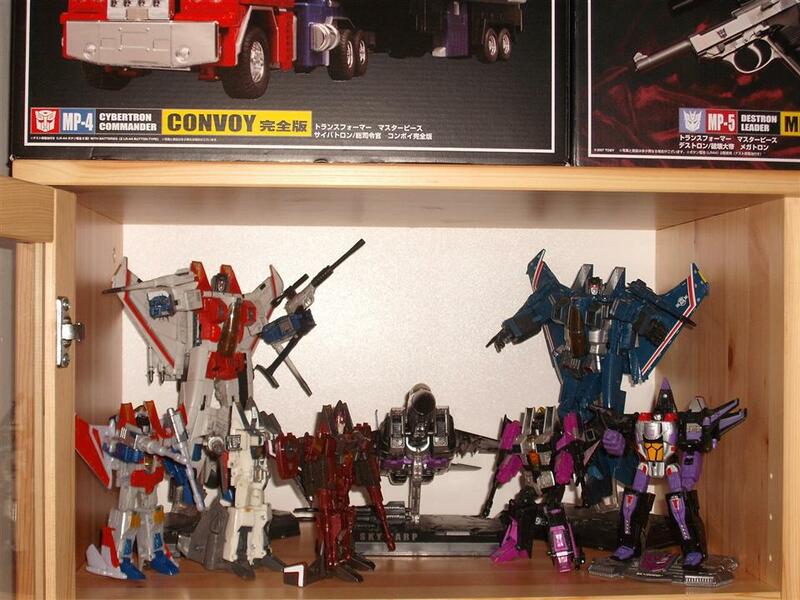 They do look great all together (specially with the G1 coloured Starscream). But if you really cant afford it, then maybe it's best to wait or not get him. Although, I think you're missing out on a fantastic version of this mold. Oh right, we're supposed to be talking you out of getting Thundercracker, right? Uh, maybe check the next post... or the one after that.. or the one after that.?. You're not alone. I need him too. If for no other reason than because there are so few Decepticon MP/Binaltech's/Alternators. Need to even out the playing field. dude if u already have screamer and skywarp u owe it to yourself to pick up thundercracker. also he seems to be more and more difficult to find so get him if u can. I knew I could count on you guys! I'll happily wait for a hasbro release. You can 100% trust him, he lives in Austin and I've brought from the guy a bunch of times. I think he'll be out late 2011 if Hasbro keeps up with 1 masterpiece per year. I have the same dilemma, just like I knew I would after purchasing Masterpiece Skywarp. As with Skywarp, I will wait for the inevitable Hasbro release and for it to go on clearance before buying that mold one more time. Prime went to Target/Walmart, Starscream/Skywarp only went to Walmart, and now Grimlock is a TRU exclusive. Connect the dots..... If Grimlock goes on clearance, you can probably forget it. Why do you want him? Because you don't have him, and he's sort of rare. Didn't Hasbro say that they had plans to bring him over to the US after Grimlock? Either way I got mine when the Takara release came out and I'm a happy camper. Why do you want MP Thundercracker? Because everything's funner with three guys (that's what she said! ).